New Solia USA Facebook Page! SOLIA USA has just released its new facebook page. Check it out at http://www.facebook.com/soliausa/ . Follow us and get the latest news, products reviews and advices to organize great events or cocktail parties with SOLIA USA Catering Supplies. SOLIA USA is the U.S. subsidiary of the French company SOLIA. 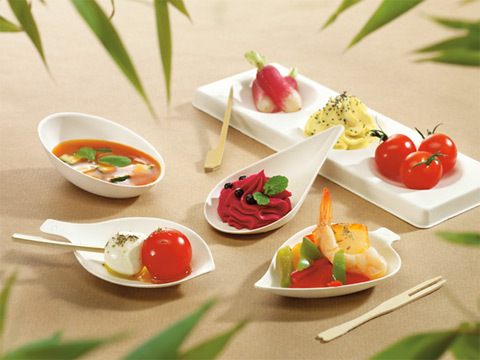 SOLIA has rapidly become the benchmark brand of disposable tableware and food packaging in Europe. SOLIA has built its reputation around its original designs, the quality of it's production and it's research and development department. SOLIA 18 years of experience allow it to be the preferred partner on the market for catering and caterers, event management and food service in general. SOLIA USA is also one of the few caterers supply company that has a complete line of Eco-Friendly disposable tableware made out of 100% compostable and recyclable materials such as Bamboo or Sugarcane Pulp.